About the product: Includes 14 individual serving-size packets (0.19 oz. each) of Emergen-C Probiotics+ Raspberry flavor fizzy drink mix powder. 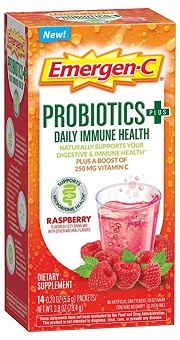 Take Emergen-C Probiotics+ every day to naturally support immune and digestive system health and get a boost of antioxidant Vitamin C.
Ingredients: Contains L. Rhamnosus GG and BB-12 (Bifidobacterium animalis subsp. lactis) (1) bacteria to help support microbiome health and your body’s natural defenses. Each packet is guaranteed to deliver 2 billion live active cultures, plus 250mg Vitamin C, through its expiration date. Probiotic dietary supplement fizzy drink mix powder is made with no artificial sweeteners, contains no dairy, is vegetarian and gluten free.